Lychee is an aromatic fruit with a sweet taste. The fruit is a drupe, 3-4cm long and 3cm in diameter. It is covered by a pinkish-red, roughly-textured rind on the outside, which is inedible but can be easily removed. The pulpy inner flesh is a translucent white, with a wet and wobbly, jelly-like texture. Within this flesh is encased a brown nut-like seed, which is around 2cm long and 1-1.5cm in diameter. The glycemic index of lychee is 50 and the glycemic load of ½ cup (approx. 113 grams) of lychee is 7.6. This is best understood by the amount of carbohydrates present in a serving size of food item. Being rich in vitamin C, lychee acts as an antioxidant which reduces the inflammation responsible for various lifestyle diseases. Hence boosts your overall immunity. Is Lychee safe for diabetics? The glycemic load of ½ cup of lychee is around 7.6 and safe for Diabetics. This depends on the amount of carbohydrates in one serving size. Carbohydrate counting is important whey you are a diabetic. 45 to 60 grams of carbs intake is recommended per meal so that the blood sugar levels remains stable. Equally distributing your carbs intake throughout the day proves to be beneficial. The vitamin C content in lychee might also contribute in improving cardiovascular health. Additionally, lychee is a good source of potassium that helps in maintaining the fluid balance and regulates blood pressure. Is Lychee suitable for weight loss? 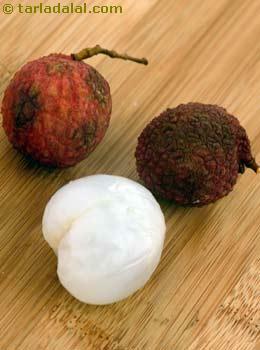 ½ cup of lychee provides around 70 calories. Thus individually lychees are low in calories but eating a handful of lychee will boost up your calories intake. It is preferable to have raw lychee as compared to dried ones as they are high in sugar. It is advisable to have lychee as a snack in between your meals. They are highly rich in polyphenols which plays an important role in increasing energy expenditure. Thus aids in weight loss.